Includes early entry at 5:00pm, meet and greet with Delain, Amorphis and Anneke Van Gierbergen, signed show poster. Tickets are on exclusive pre-sale at https://www.enterthevault.com/moreInfo.php?id=8768 from now on until November 2. General public sale starts November 2, 2018 online at www.theinvisibleorange.com, and in person at Red Cat Records and Neptoon Records. 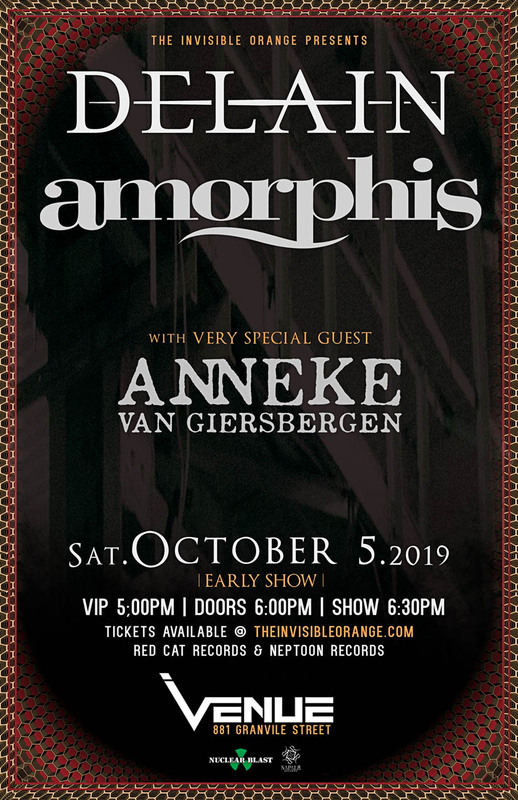 The Invisible Orange presents Dutch melodic / symphonic metal greats Delain, Finnish heavy rockers Amorphis and Dutch singer / songwriter Anneke Van Giersbergen (ex-The Gathering) will be joining forces for a North American tour. This tour will stop in Vancouver on Saturday, October 5, 2019 at Venue on Granville (881 Granville Street).